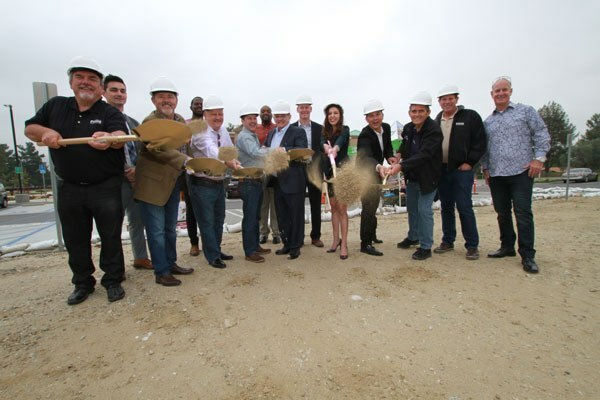 On Saturday, May 19th a groundbreaking ceremony was held for the second phase of construction of the Shops at University Park, an upscale shopping center located across from Cal State San Bernardino (CSUSB). When completed, this new retail space will house an additional six new businesses. The San Bernardino Area Chamber of Commerce and the JR Watson & Associates Development Corp. conducted the groundbreaking ceremony. Among those in attendance were City of San Bernardino Mayor Carey Davis and Councilman Henry Nickel, CSUSB President Thomas Morales, representative for State Senator Mike Morrell’s Office Joshua Monzon, and Superintendent of the San Bernardino City Unified School District Dr. Dale Marsden. Nickel and Monzon presented the development team with a certificate in recognition of their investment in the city. One of the new tenants is Coffee and Tea Exchange, owned by Christine Li, Shiny Shan, and Qina Song, who provided free beverages and pastries for everyone in attendance. They currently own locations in Hollywood, Lake Arrowhead, and Big Bear. Morales addressed the audience by discussing the relationship and partnership being fostered between developers JR Watson & Associates and the university. Jim Watson of JR Watson & Associates Development Corporation said that the construction of the new building is expected to be completed by September of this year. These new retail businesses are expected to bring additional employment opportunities to the city as well as additional tax revenue.